Control of blood pressure in hypertension has generally been achieved in the past by the use of diuretics and betablockers, either alone or in combination with vasodilators or drugs interacting with the sympathetic nervous system. These treatments obviously have highly beneficial effects since several controlled trials have shown that lowering of blood pressure reduces cardiovascular mortality and morbidity in treated hypertensive patients. (Australian Therapeutic Trial of Mild Hypertension 1980; Smith 1977; Veterans Administration Cooperative Study Group 1970). 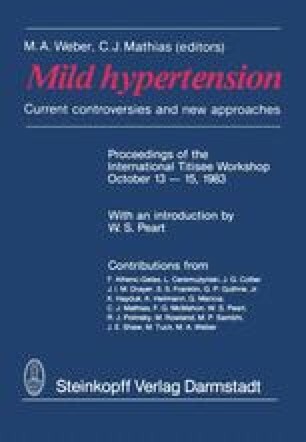 There are, however, some limitations in this approach to the treatment of hypertension. In approximately two thirds of unselected patients, satisfactory control of blood pressure is not obtained with the drug of first choice alone. Therefore it is often necessary to prescribe two or more drugs. The antihypertensive effect of diuretics can be limited by overstimulation of the renin-angiotensin system (Alhenc-Gelas et al. 1978; Laragh 1973) and that of vasodilators by sodium retention (Ibsen et al. 1978). Side-effects such as postural hypotension, disturbance of the microcirculation or erectile dysfunction are not uncommon (Smith 1977). Recently, two new classes of antihypertensive agent: converting enzyme inhibitors and calcium channel blockers, became available for the treatment of hypertension (Table 1). Although their mechanisms of action vary they are all able to decrease vascular resistance and lower blood pressure in patients with mild to severe hypertension.